Bad Wolves, the band managed by Zoltan Bathory of Five Finger Death Punch, have just signed with Eleven Seven Music, one of rock music’s most iconic labels. To mark that event the band have released the track “Toast To The Ghost”, the first song to be revealed from their debut album due next year. On 2nd November the track “Toast To The Ghost” was previewed exclusively via Sirius XM Radio’s “Liquid Metal”. The track is the first song revealed off the band’s debut album, slated for Spring 2018 on Eleven Seven Music. The track provides a taste of what’s in store for fans on the forthcoming collection: bold, metal-infused anthemic hard-rock. 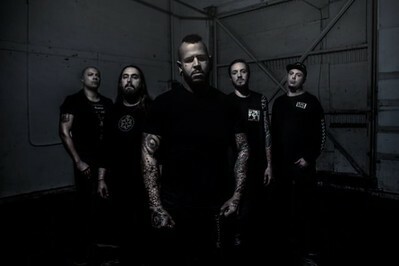 Consisting of of vocalist Tommy Vext (ex-Divine Heresy), drummer John Boecklin (ex-DevilDriver), guitarist Doc Coyle (Vagus Nerve, ex-God Forbid), guitarist Chris Cain (Bury Your Dead), and bassist Kyle Konkiel (ex-In This Moment), Bad Wolves burst onto the scene earlier this year with the self-released debut single “Learn To Live” and quickly became ones-to-watch. “From a creative standpoint we were very fortunate to garnish the support of not only a friend we trusted as a manager but also respected as an artist and entrepreneur,” explains the band of the decision to work with Bathory’s Management Company. “Zoltan's outside the box thinking and unique perspective helped broadened the vision of what we hope to accomplish as a band”. “I knew these guys for many years from their previous bands so I knew they were all exceptional musicians, but when they formed “Bad Wolves” and played me the first few songs I thought …Okay... there is fire here, this one has the magical combination. Hard work and persistence always outstrip talent, and these guys have both,” adds Bathory.